Now that the 'experts' have told us that eggs are 'good' for us and not the cholesterol bomb they said they were, let's talk about eggs - what are the best eggs to buy, if you're buying chickens to lay eggs, what chickens should you buy and if you have your own chickens now, how do you get the best eggs from them. 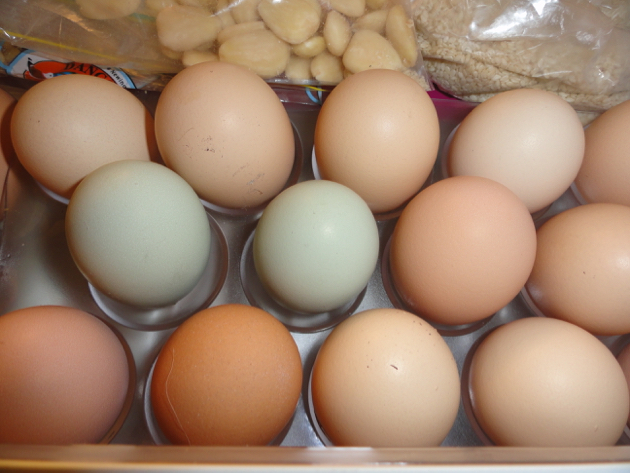 A variety of our hens' eggs - the blue eggs are Araucana eggs. All eggs contain about 6 grams of protein - 3 grams in the yolk and three grams in the egg white. That is about 12 percent of the daily protein requirement for the average person. There is no doubt about it, after testing eggs from various sources, free range eggs are thought to be the best eggs you can buy. Make sure that 'free range' on the carton is really free range - the chickens should be outside in the sun most of the day, not live in over crowded conditions (there is a limit on the number of chickens allowed in each area), sleep in a barn overnight and be able to eat grass and the bugs that live on it. It is the grass and bugs that gives eggs the boost of Omega 3 oils that are so beneficial and make the eggs tasty. If you're not sure about the eggs available at your supermarket, write and email to the manager, or head office, asking them to clarify the free range issue for you. If you still can't get a straight answer, many cartons have the supplier's name on the carton, so look up their phone number and ask them. Lulubelle, one of our barred Plymouth Rocks. 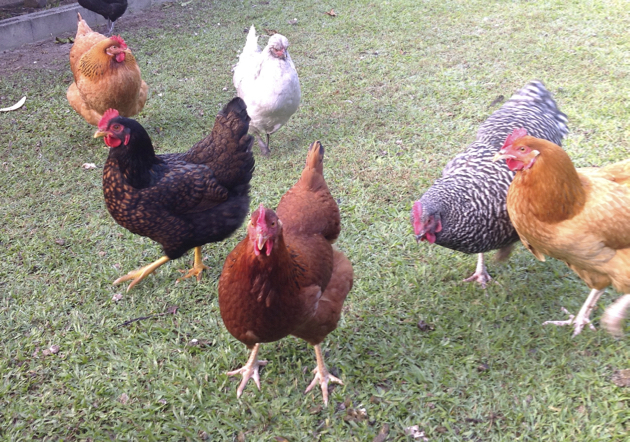 From left: buff Sussex, Barnevelder, (back) Araucana, Rhode Island Red, Plymouth Rock, New Hampshire. 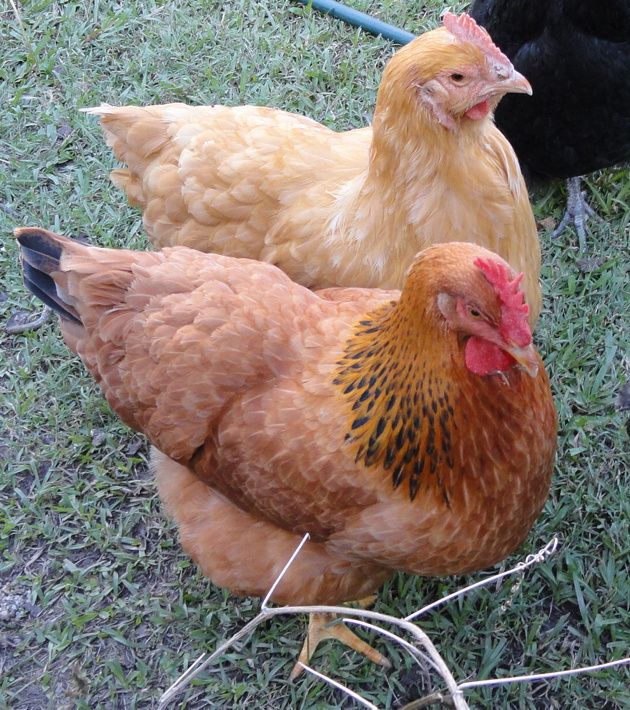 Martha and Margaret Olley our buff Orpington and buff Sussex girls. Buff is the colour. I believe that buying point of lay red/brown, black or white chickens produced for the caged egg industry is one way of supporting that industry. If you would never buy caged eggs, don't buy the chickens bred to lay those eggs either. However, if you already have those chickens, how can you improve the eggs they lay. This applies to all breeds of chickens, heirloom or pure breeds too, the single best step to take is to give your chickens access to grass. It will boost the nutritional value and taste of the eggs the chooks lay. Always give your chickens free access to fresh water, they can be fed on pellets with a small amount of grain but if you add greens to their diet, in the form of grass or vegetables leaves, that will make those dark yellow yolks we all love and it will improve the quality of the eggs. Currently we have eight chickens and we get about six eggs per day. I'm feeding them half a small bucket of pellets and a hand full of grain per day. They have access to greens every day and occasionally they get some of our leftovers. Having had many types of heirloom breeds over the past 35 years has given us a good opportunity to decide which eggs we prefer. This is important because we keep chickens for the eggs. Currently we have Plymouth Rocks, Barnevelders, Australorps, Frizzles and a Wyandotte. In the past we've had Welsummers, Pekins, Hamburgs, New Hampshires, Orpingtons, a variety of Sussex colours, Rhode Island Reds, Araucanas, Campines, Old English Game Hens and Faverolles. Of all those breeds, I believe the Barnevelder lays the tastiest eggs and the New Hampshires are the most consistent layers in a backyard environment. 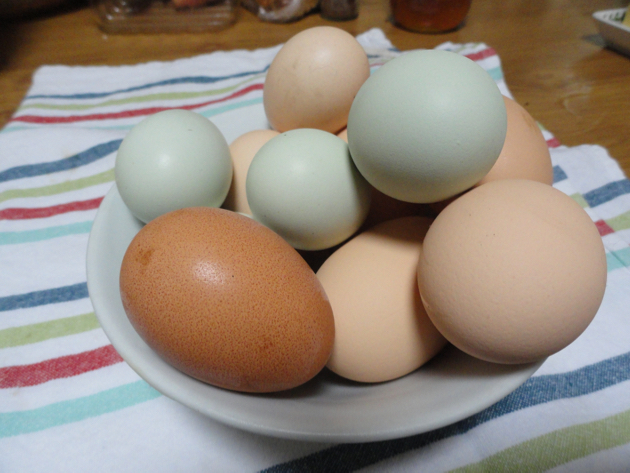 Yesterday's eggs, with the dark brown Barnevelder egg on top. 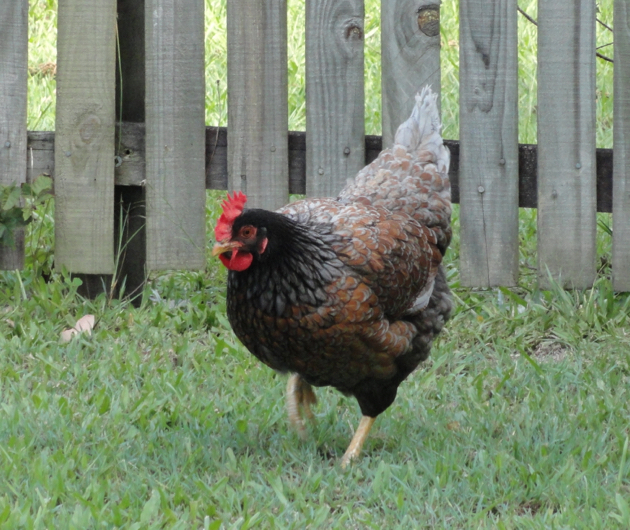 Keeping heirloom chickens is similar to growing heirloom vegetable seeds. They've stood the test of time, they're part of the diverse poultry world, they'll lay longer and are generally healthier than mixed breed chickens. And keeping a few of the pure breeds will help keep that breed alive so they're there for your grandchildren to choose from too. Which breed produces your favourite eggs? How interesting, I have flagged this post for future reference. There are egg farms near us and you can see that they leave lights on 24/7 and they do let the hens out....seems like once a week for a couple of hours. The poor things just stand around huddled against the huge shed staring blankly out across the horizon. I sadly reckon that these eggs would be therefore deemed free range. We got some chickens a few months ago from a chook lady who had a lot of chickens!! We got four Isa Browns and one Buff Sussex who we called Sassy. In Tasmania it seems that Isa Browns are very common and they are really easy to buy, affordable and just about everybody has them. When we lived in Queensland, I'd never really heard of Isa Browns before. When I was growing up we had Australorps and New Hampshire Reds. ISA browns are one of the most common breeds bred specifically for the commercial (including caged) egg industry. That's why they are so easily available. Oh I love my eggs Rhonda! People are often shocked to hear that I eat scrambled eggs for my breakfast almost every morning. What about all that cholesterol they say?! I've never worried about it and have never had a cholesterol problem. Rhonda thank you so much for those links! If I can't get eggs at the farmer's market I agonise over brands, this is an immense help. We have Isa Browns and Barnevelders. In the past we had Australorps which have to be the best, most friendly chooks ever. They would constantly follow at my heels, always interested in what I was doing, what the cat was doing, what the dog was doing, who the visitors were......... And they had the benefit of going broody easily making good mothers. Unfortunately their size meant that they could wreak havoc in the garden so now that we don`t have a spare paddock for them, I have to live on my memories!! Interesting Rhonda that your Barnevelder egg has a scratch on it- I was trying to get together half a dozen eggs to enter in the local show ( Brown eggs-6) but could not get one without a scratch. The brown speckled eggs are so pretty so it was a shame. Still, one of my Isa Browns came through , laying very dark brown eggs which one first prize!! Good information, I wish we could keep chickens, but live where that's not possible, We have a friend out in the country though who has started raising some and we're looking forward to getting eggs from him. I can now buy free range eggs from two new local farms who have taken on eggs to diversify their produce. One is 15kms out the road and they have 250 brown hens who free range on grassy paddocks and the other is further out of town. Both their eggs are available in our Foodland. The flavour is unbelievable so I enjoy them soft boiled or poached. Yum! Thank you for your thoughts on heirloom breeds. Your post is very timely and helpful. 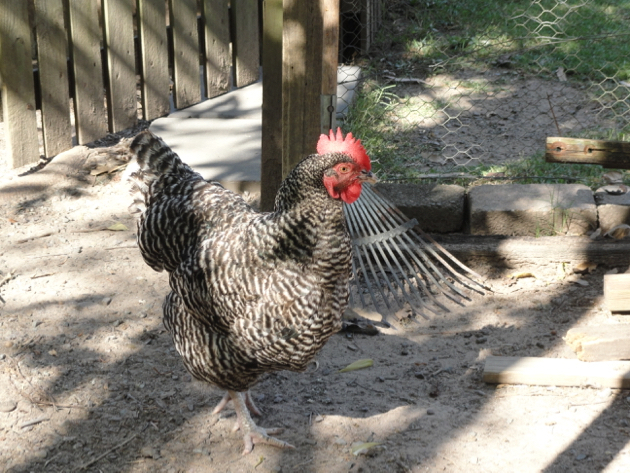 I have been researching which chickens to purchase as we have almost finished building our chicken coop and run. I usually purchase my free range eggs from a nearby roadside stall but if I don't get there very early they go fast and have to purchase them from the weekend markets or shops. Will go see Kate at Beautiful Chickens. Another wonderful "heritage" breed chicken is the delaware. 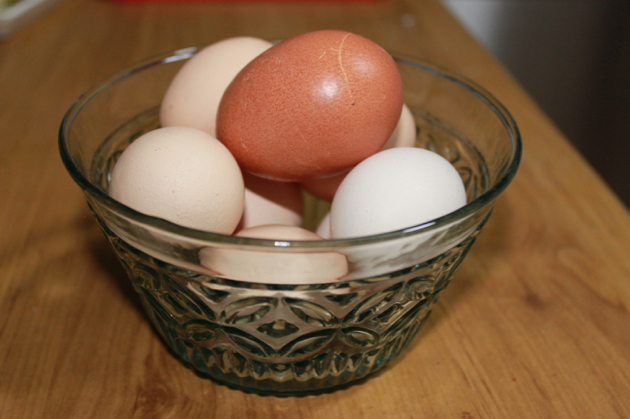 They are not only beautiful and graceful but are good layers of a medium sized light brown egg. I have raised many, many types of chickens and the Delawares are my all time favorite! Aracaunas are also one of my favorites! My chickens free range all day everyday and our eggs are amazing! And I agree grass and bugs are key to those awesome eggs! Be aware that there are many inconsistent standards for 'free range' including some pretty dodgy ones. This is an example of what happens when an industry regulates itself. The chooks must have 'access to ourside' and for many barn raised chooks this means the little door being opened in the bright middle of the day, with no overhead cover (they were originally jungle fowl and still fear predators from overhead) and a little area devoid of any grass. Not surprisingly, most won't actually go out under those conditions and so farmer shrugs and shuts the door again. They've had their 'access' so he's in the clear. Still a pretty sad existence but probably unavoidable while we all expect unlimited eggs at low prices. I think I'll always have chickens, it's the only way to know that they were treated right. If I could get my head around killing them, I would produce my own chicken meat for the same reasons - it should have the best possible life until its death. Merci pour toutes ces informations très utiles !!! We have quite clear legal definitions of egg types in the uk but free range is a bit of misnomer really. What is sold as free range will be as others have described in the comments but they are allowed to call the eggs that as they are being raised as per the legal definition! We don't have room for chickens at the moment not sure if that will change, maybe.....in the meantime we buy our eggs direct from a farm where they are most definitely free range we have to be careful we don't run them over as we drive in! We picked up our 4 chickens yesterday from the local feedbarn.Our daughter has purebreed chickens that are beautiful and we were going to get some chicks from her but a visit from a python ended that idea.So we have 2 black,1 white and 1 brown one that are about 16 weeks old.Was wondering do they get more plumage after this time as they look rather ordinary ?They have an enclosed run quite large but as yet havent ventured out.Then again we have had heaps of rain ,thunder and lightning over night.so hopefully maybe when the weather improves they will explore more. Those chickens will probably put on more feathers and their combs will grow but they'll never look like pure breeds. At 16 weeks they're still young so give them good food so they grow up healthy. Once the sun comes out and they get used to their new home they explore more and settle in. They've still got another six or seven weeks before they start laying. You'll know they're close when their combs grow and go from pink to red. Good luck with them. Thanks for the feedback, Scott and Karen. I only recommend businesses I deal with myself and that I'm happy with. It's good to know you're happy with your chickens. Nora Barnacle - great name for a great looking' chook! No wonder she lays the best tasting eggs. Our flock is a mixed lot of bantams that we chose because we liked their colours and feather patterns. Silver lace, blue lace, silver pencil, white and black Wyandottes, one Sussex hen (the matriach) and several Rhode Island reds. The roosters are Rhode Island and Silver Lace. We don't know which ones are the best layers; we happily collect the eggs at the end of the day and bless all their little hearts! Your girls look absolutely gorgeous and I love that you have all different kinds too. We have 2 at the moment - a barnevelder and a wheaten maran, and are waiting for new ones to become available in our area. I'm hoping for a blue orpington next and when I go north soon I am hoping to pick up a silver grey dorking. Chookies are such rewarding animals!